My cousin sent me this Internet meme. He and I share a penchant for a good pun, and he knew I’d appreciate this play on words. He was right, but after I laughed, I also wondered why we call a group of crows a “murder of crows.” I knew that animals often have collective names beyond the prosaic “herd of cows” or “flock of seagulls” (even though the latter also got a band out of the deal). You probably know the more well-known “pride of lions,” “pod of dolphins,” and “school of fish”; you may also have heard of the officious sounding “parliament of owls,” the showy “ostentation of peacocks,” and the aptly named “chattering of starlings.” It even turns out the group term “barrel of monkeys” long predates the 1965 children’s game (now produced by Milton Bradley) with the same moniker. But who makes up these names, and what exactly is the origin of a “murder of crows”? Unfortunately, the historical record is elusive, and even a crowbar couldn’t help dislodge the truth. We do know The Boke of Saint Albans (1486)—attributed to Juliana Berners (sometimes given as Barnes), who was purported to be a prioress of an abbey near St. Albans, England—contained a three-page list of these collective terms. Historians, however, believe that the terms were most likely simply collected by Berners (not created by her). The book was published in the transition period between Middle and Early Modern English, but you can attempt to read a copy of a 1905 reprint here. 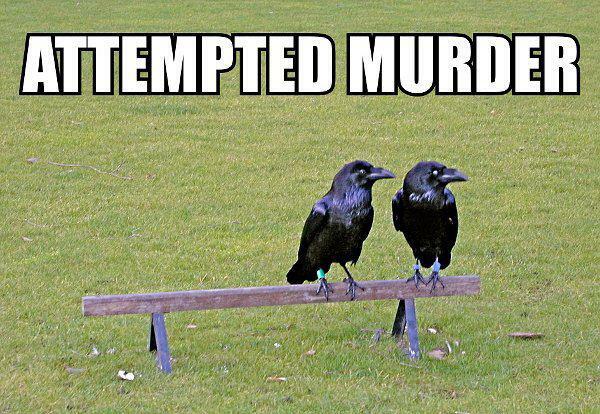 The meaning behind murder of crows is even more slippery. There is much speculation, but little verified truth. Some suggest that crows occasionally hold a crow tribunal where an offending member of the crow society is tried and sometimes sentenced to death by the other crows. This, however, seems to be more folklore than fact. Others note that crows and other black birds are considered omens (usually bad ones), and the negative connotations of a murder of crows may derive from that. Still others believe the term evolved from crow behavior during war. Because the crow is a carrion bird, they were often seen picking over the dead and wounded after a battle, which certainly did not help their reputation as harbingers of ill fortune. None of these three theories has been conclusively proven, however; so although black birds of a feather may flock together, I’m destined to eat crow and admit that I still don’t know exactly why these particular avian creatures are collectively a murder. But it is killing me. The PBS series Nature had an episode on crows. See their fact sheet. Want more collective animal terms? The San Diego Zoo has a whole page.